Gov. Bobby Jindal told the Baton Rouge Press Club Wednesday he supports the right of the people of St. George to incorporate as a new city or form a new school district. At the same time the governor was making his remarks, Mayor-President Kip Holden was taking the opposite position before the Baton Rouge Rotary Club and promising years of litigation if the people of St. George vote to incorporate. Jindal, whose office plays a key role in the incorporation of new cities, was having none of that. “I respect the will of the people, not just on this issue but in general. Conservatives tend to believe that government that governs closest to the people governs best. So I tend to defer to the will of the people to make their decisions themselves,” he said. Under state law, if 25 percent of the voters in a proposed city sign a petition, the governor calls a special election on the matter. However, the governor does have some discretion, and Gov. Kathleen Blanco refused to call the election for the City of Central, because of alleged defects in the wording of the petition. She later approved the election. If the citizens of the proposed city vote to incorporate, Jindal would also have the responsibility of appointing an interim Mayor, Police Chief, and members of the City Council. Who he appoints could be of considerable importance, because the person appointed interim Mayor has a good chance of being elected when special election is called within the next six months. Under state law, incorporation of new cities is a matter almost entirely in the hands of the voters of the proposed city. The issue of incorporation of St. George will not be voted on by the Metro Council or the Louisiana Legislature. However, the Metro Council could conceivably put up legal roadblocks, such as filing suit or passing an ordinance to attempt to deprive the new city of its normal funding sources. Whether such efforts would be successful or even delay the creation of the City of St. George is questionable, because Louisiana courts have already decided many of the issues that could be raised. Regardless of what happens, Gov. 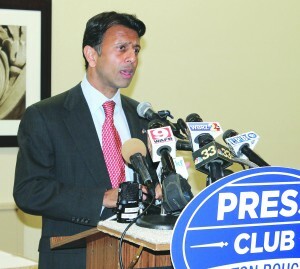 Jindal made it clear Wednesday that he will respect the decision of the voters of St. George, if they should decide to incorporate.